Syarat Biasiswa UEM Pelajar Lepasan SPM dan STPM. Mungkin anda berminat untuk memohon Biasiswa UEM untuk pelajar lepasan SPM dan STPM. Sebelum memohon anda patut baca terlebih dahulu Syarat Biasiswa UEM Pelajar Lepasan SPM Dan STPM yang perlu anda ketahui. Program Biasiswa UEM ini adalah terbuka kepada semua pelajar Malaysia yang layak dan berminat. Yang baiknya biasiswa ini akan menyediakan kerja kepada pelajar yang ditaja sebaik sahaja habis pengajian mereka. Sebelum memohon ada baiknya anda buat semakan Syarat Biasiswa UEM Pelajar Lepasan SPM dan STPM untuk panduan dan rujukan anda. Anda boleh membuat permohonan Biasiswa UEM online. Buat masa ini portal rasmi untuk biasiswa belum dibuka, anda kena check dari masa ke semasa. Sebaiknya anda semua cuba apply biasiswa ini bila permohonan online dibuka nanti di portal rasmi mereka. Jika anda memenuhi syarat Biasiswa UEM Pelajar Lepasan SPM dan STPM anda boleh terus memohon. Di bawah adalah maklumat Syarat Biasiswa UEM Pelajar Lepasan SPM dan STPM untuk panduan anda. UEM Scholarships (Overseas)* You will undergo a pre-university programme at Kolej Yayasan UEM (KYUEM) at Lembah Beringin, after which you will proceed to study at a reputable university overseas, notably UK and Australia. * You will study at a reputable local university. * Excellent academic track record in Form 4 & 5, with no less than 7 A+/A in relevant subjects in the SPM examinations. All applicant must be a Malaysian citizen. Proficient in English, hardworking, possess positive personality traits and have an outstanding extra-curricular record will be kredit to your application. The scholarship covers academic expenses including tuition and exam fees, air-fares and insurance, allowances for books, computer and subsistence. Terms and Conditions* The applicant must have a good command of written and spoken English. * The applicant must not be bonded to other institutions or organizations. * The successful applicant shall not accept any other scholarships or forms of financial aid from other sources whatsoever while his/her agreement with UEM Group is still in force. * The successful applicants subject to (i) the terms and conditions stated in the scholarship and bond agreement which the successful applicant(s) and his/her guarantors are required to enter with UEM Group; and (ii) pass a medical examination at any one of UEM’s panel clinics/hospitals. 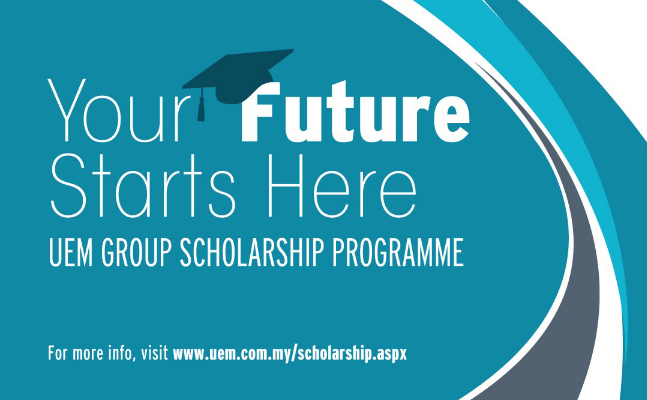 * Each applicant is responsible for all cost incurred in the course of applying for the UEM Group Scholarships. * UEM Group shall not be responsible or liable for any problem, loss or damage of whatsoever nature suffered by the applicant(s) due to any delay and/or failure in submitting his/her application online as a result of any network, communication or system error, interruption and/or failure experienced by the applicant’s internet service provider and/or by UEM Group. * All decisions of UEM Group in any matter in relations to the UEM Group Scholarships shall be final and no discussion or correspondence will be entertained. * The applicants must complete all details requested by UEM Group as stated on UEM’s website and submit the same online on the respective closing dates as detailed on the website. Only applications submitted online shall be accepted. * Only short-listed applicants will be notified by telephone call for an interview. * The short-listed applicants must bring his/her original certificates during the interview. Semoga perkongsian mengenai Syarat Biasiswa UEM Pelajar Lepasan SPM dan STPM bermanfaat kepada anda.